I remember…going to UHS for an orientation visit sometime late during 8th grade. The school building seemed sooo big, and I wondered how I’d ever find my way around to my classes. After all, I’d spent the last 8 years attending a two-room school where each class had no more than 6-10 students. It was comforting to see familiar faces from other similar schools such as Bellview and Fairview, as well as Sinks Grove. I remember…. the Halloween Carnival. Classes featuring different booths as fund raisers. One year we had a fortune-teller booth. No doubt, some of the things we did would be forbidden in today’s schools. I remember….the fun of “cider making” during the fall of the year was used as a class fund raiser. We visited relatives and neighbors, taking advance orders for gallons of cider. A Pickaway resident allowed us to use his cider mill. Apples gathered from a variety of Monroe County trees were tossed into the mix as we spent evenings/Saturdays making and bottling the jugs of cider. Recipients of our product always seemed happy when we arrived with the cider and….oh, my gosh, it was NOT pasteurized!!!!!. But I never heard of a single person getting sick. I remember… the sleigh riding parties at John Kidd’s farm. Don’t ever remember being cold, but surely we were. I know we didn’t leave cold, because there was Johnny’s wonderful mother serving us all the hot chocolate that we could drink as we tramped into her house (wet boots and all), worn out from all the fun in the snow. I remember …the school proms and all the hard work in decorating for the big event. But then, how awesome the transformed gym looked by evening light…….and our football games, coming home hoarse from all the yelling. The thrill when we won, and the disappointment when we lost. But we won more than we lost, right????? I remember….our senior trip. How exciting to be 17 and visiting NYC, seeing the Empire State Building and the Statue of Liberty, staying up talking in our rooms most of the night…..then sleeping all the way home on the train. 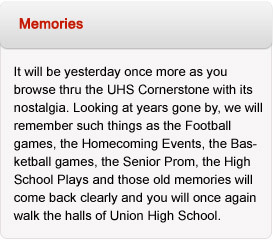 Yeah, just a few great UHS memories.